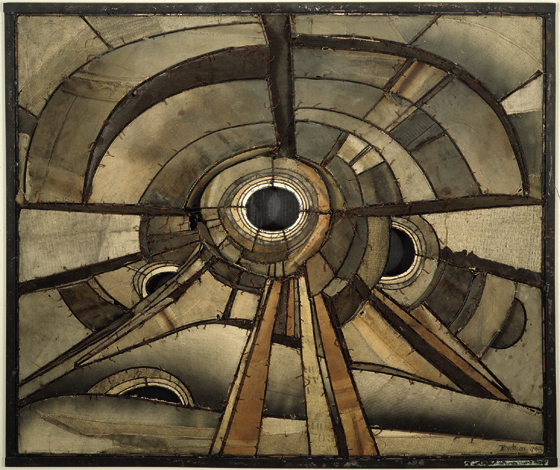 One of my absolute favorite artists of all time is Lee Bontecou. There are many reasons why I am inspired by and respect her art and career. I am enticed by her experimental use of materials and ways of making. She created work in a wide variety of mediums, ranging from: welded steel, canvas and wire sculptures to graphite or soot drawings on paper or muslin to vacuum formed plastic sculptures. Some of her other mediums include colored pencil, charcoal, leather, epoxy, silk, wood, casein, porcelain, and Plexiglas. She has created her own language and iconography within her vast body of work, and she refuses to limit its interpretation. Critics and historians have classified her work as: feminist, minimalist, post-minimalist, latter-day surreal, futurist, and arte povera. Regardless of the interpretations and readings of her work, of her own work, Bontecou said that she intended to encompass “as much of life as possible – no barriers – no boundaries – all freedom in every sense.” And, in this statement, I sense a kindred spirit. 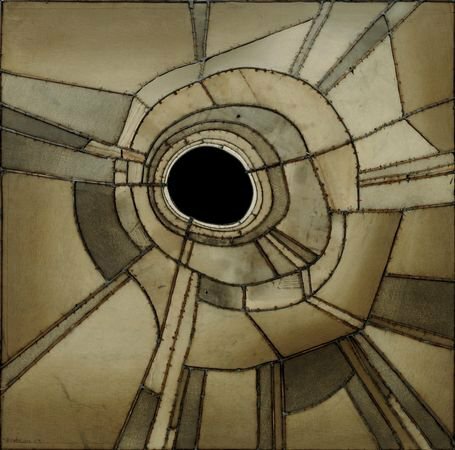 Lee Bontecou was born in 1931 in Providence, RI and raised in New York. She attended Bradford College in Massachusetts and the Art Students League in New York from 1952–55 where she studied sculpture under William Zorach. In 1954, she attended the Skowhegan School in Maine. She received a Fulbright to study in Rome in 1957–1958. She began exhibiting her work in Italy in 1957 and found great success in her art career during the 60s, exhibiting at the Sao Paolo Bienal, The Museum of Modern Art New York, The Corcoran Biennial, in Washington, DC, the Pasadena Art Museum in California, the Galerie Ileana Sonnabend in Paris, and various museums throughout Germany. In 1972, an exhibit of her sculpture and drawings was presented at the Museum of Contemporary Art in Chicago. A few years after that, she left New York and moved to Pennsylvania and began teaching. Her work was extremely experimental and highly original. She produced work that was unlike any other work being shown at that time. It would have been easy for her to pigeon-hole herself in the art of her success – in the type of work that made her successful and popular – but she didn’t stop with what worked. She continued to explore new mediums and new ways of creating things. She divorced the art world as an exhibiting artist for almost 30 years, ignoring or declining invitations to show her work. 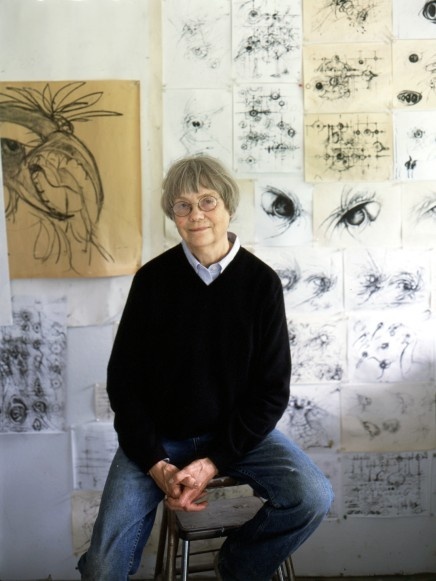 In 2003, a retrospective of her work, which included the art she made during her decades-long retreat from the public, was organized by the Hammer Museum in Los Angeles and the Museum of Contemporary Art in Chicago. I was fortunate to see this show. This exhibit also traveled to the Museum of Modern Art in New York in 2004. At 81 years old, she continues to create and exhibit. Her work was recently shown at Freedman Art in New York, October 2011-February 2012. This entry was posted in Uncategorized and tagged "ALL FREEDOM IN EVERY SENSE", ARTIST CAREER, DANIEL BAIRD, DRAWING, HAMMER MUSUEM, INTERDISCIPLINARY ART, LEE BONTECOU, MCA CHICAGO, MUSEUM OF MODERN ART, PAINTING, SCULPTURE, WILLIAM ZORACH. Bookmark the permalink. This post revised from one first published at Marginalia. http://blogs.colum.edu/marginalia/.